Food sovereignty is a term coined by members of Via Campesina to refer to the right of peoples to define their own food, agriculture, livestock and fisheries systems, in contrast to having food largely subject to market forces. 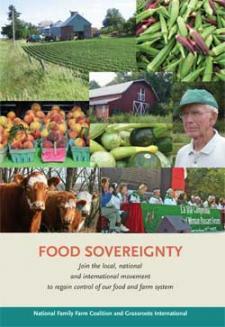 Food Sovereignty is undermined by multilateral institutions and by speculative capital. The growing control of multinational corporations over agricultural policies has been facilitated by the economic policies of multilateral organizations such as the WTO, World Bank and the IMF. Regulation and taxation of speculative capital and a strictly enforced Code of Conduct for TNCs is therefore needed. For twenty ideas on how to make food sovereignty a reality in your own community, check out this What Is Food Sovereignty? factsheet.